Now you can get this Tripel Connector USB Flash Drive that is 128GB in size making it really versatile to use. 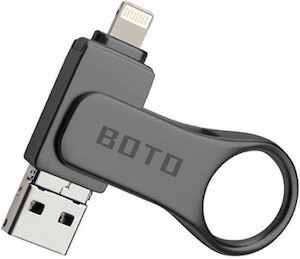 This flash drive has a swivel design with on one size a lightning port and the other size has a classic USB connector that can fold open and then it becomes micro USB. 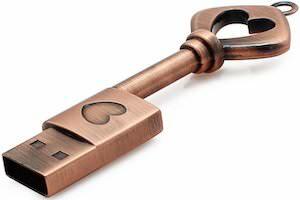 And this flash drive comes in 3 colors black, silver, and rose gold and it has a loop on one side so that can hook it on your key chain and always have it handy and ready for use. 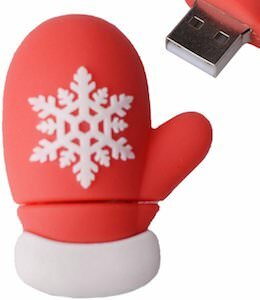 So if you like a thumb drive you can use on many devices then come check out this Tripel Connector USB Flash Drive. Why get one fun thumb drive when you can have this 5 Pack Of Animal Flash Drives. 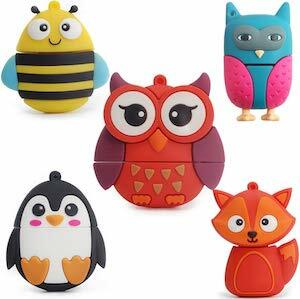 Yes, you will get two owls, a bee, penguin, and fox flash drive and each drive is 8GB and just adorable. And if you are looking for some fun drives to give to friends or the kids then now you can have 5 fun drives they can be using. Each USB connector is hiding inside the animals and that will protect them from dirt and from being damaged and just uncap the port to start using it. Stop looking for the perfect drive to use because you are all set with this 5 Pack Of Animal Flash Drives. 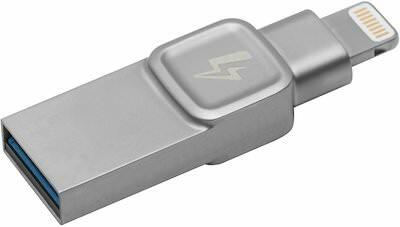 Now you can get a Kingston Bolt Lightning And USB Flash Drive. The flash drive looks like most flash drives with the exception that besides the normal USB connector it also has a Lightning connector. Now you can use it as a normal USB 3.0 flash drive but also as a storage devices for your iPhone or iPad making it perfect for backing up your pictures and even to take picture to directly but it can also store files you want to access on your phone. You can get the Kingston Bolt in 32, 64, and 128GB versions so that you can get the perfect size for your needs. And this flash drive comes in it’s own carry pouch that still gives easy access but makes it easy to have it on your key chain. Come and check out his Kingston Bolt Lightning And USB Flash Drive. 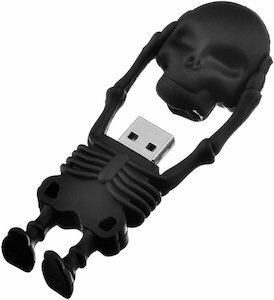 If you would like a fun and unique USB thumb drive then you should check out this skeleton USB flash drive. The skeleton is black and show it holding its own head and when you pull the head up then you can see the classic USB port ready for you to use and as the head is connected to the body you don’t have to worry about loosing your plug cover. You can get this black skeleton thumb drive in many storage sizes so that you can have the perfect size drive for you. So give up on boring drives because you can get this fun Skeleton USB Flash Drive. If you like wine and need some data storage then you should check out this USB flash drive that looks a wine cork. The flash drive would be great for storing you list of wine you own or much wine your drank but it can also hold things like movies or family pictures. And as it looks so real to a wine cork it is a great way for data you don’t want people to easily find. 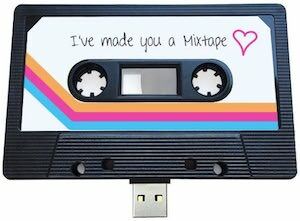 The USB stick is USB 2.0 and holds 4GB of space and that may not be to much if you like to put all your movies on it but it is plenty of space for documents. 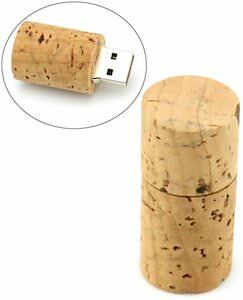 So have a drink and order your Wine Cork Flash Drive. 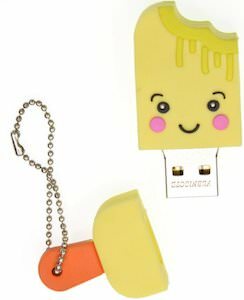 No need to have boring USB flash drives because you can have them that looks just fun like this ice cream USB flash drive. The flash drive comes in 3 sizes 8, 16, and 32 GB and you can even choose what kind of ice cream you like so if you don’t like the yellow one then just pick a different one and yes they do have chocolate just click on the picture to see. 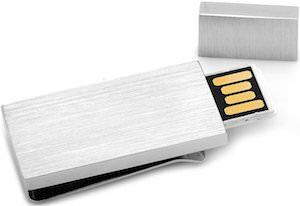 So now you can always pick you flash drive in a stack of thumb drives as yours just looks fun and different. Come and get your Ice Cream USB Flash drive. If you want a USB flash drive that you never have to worry about then this is the thumb drive you need. This USB flash drive is also a money clip so just clip it on your paper money and you know that you watch over it. The drive is made from stainless steel and just looks amazing. The cap on the front will keep the USB port hidden until you need it and people at first glance will not expect that you have your important data right around your money. Come and order your own USB Money Clip Flash Drive.